"Egypt is Free!" chanted the protesters. Well, let’s hope so. At least autocratic 'President' Hosni Mubarak has been removed from his 30-year position that he & his National Democratic Party held through a mixture of constitutional manipulation, repression & rigged elections, cronyism & the backing of powerful foreign allies, primarily Israel & the U.S.
Now the military holds the reigns. Let us all hope that unfolds better than it sounds. At least the will of the people of Egypt has prevailed & the possibility of a better future looms on the horizon. In Egypt, popular music is dominated by slickly packaged songs that are mainly formulaic & for the most part uninspired. But a few bands are providing an alternative. One is Black Theama, which combines Nubian rhythms with R&B, hip-hop, reggae & African-influenced sounds, with lyrics sung in colloquial Egyptian Arabic. 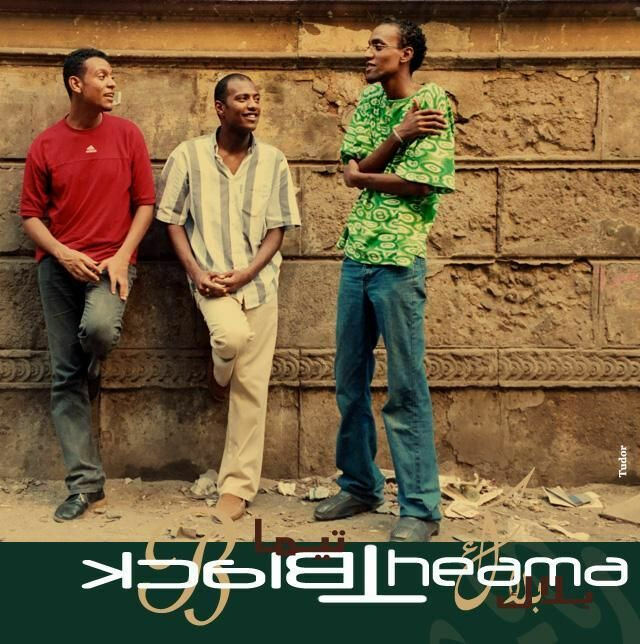 Getting to hear Black Theama isn't easy, even for Cairenes with a taste for music found off the beaten path. The band refuses to work inside the commercial music industry, preferring to painstakingly save money to produce its own recordings one at a time, with the help of friends & supporters. As such, it has almost no records to speak of, & its shows are not heavily advertised. Nevertheless, Black Theama's avid underground following regularly packs venues. Nubian actor Amir Salah Eddin is one of three singers who front the band. He says the group takes its name, "Black Theme," seriously, as it does its goal of avoiding standard pop-music cliches in its lyrics. Their song "Sheraton" features lyrics describing an early-morning Cairo scene as ordinary Egyptians walk home to their poor neighborhoods, shuffling past the tourist-filled towers of the five-star hotels that line the Nile River. Singer Mohammed Abdo, who met Salah Eddin through theater work, says they try to celebrate the black experience in Egypt through their music. "Being dark-skinned in Egypt is always connected to the South," Abdo says. "& people from the South have their own character, their own culture, even their tone of voice is different." Ancient Nubia included much of northern Sudan & southern Egypt. Southern, dark-skinned Egyptians are invariably referred to as Nubians & traditionally they were given menial or servants' jobs. "Why not ask me about the corrupt politicians who stole my dreams? Or about wealthy countries with children sleeping under bridges?" Black Theama is: Amir Salah, Mohammed Abdo, & Ahmed Bahr - vocals; Amro el Shimy - keyboards; Medhat Ali - Spanish guitar; Mostafa Guida - bass; Mohamed Samy - kaman; Amro Gahien - oud; Mahmoud Abdulaziz - drums; Mohamed Zatona - percussion; & Adel Mikha - tabla. This is really incredible- I don't think I ever would have found it if it weren't for this post. Thanks for sharing this. Also- I too have been following the course of the protests in the Middle East very closely every day, and I really appreciate this series of posts that you're doing to mirror the aspirations of so many millions of our brothers and sisters. What a great way to share in their hopes of a better future- through sharing the music of some of their most progressive and daring musicians. I think Black Theama is a particularly poignant choice. Excellent post NØ. As maestro mentioned above, I think this is a particularly poignant choice, not to mention that judging by your description, this sounds as if it is going to be amazing. I'm off to download and listen to it now. Thank you. I forgot to comment on the recent events in Egypt. I have to admit that I'm a bit cynical when it comes to situations such as this. Normally I would say that it is never a good thing for the military to hold power within a country. However, I have had complete faith in the Egyptians since the protests first started. Even when many political analysts were saying that it would be impossible for the Egyptians to carry out a revolution similar to the Tunisians, I kept faith that they would. Not only were they able to pull it off, they required fewer days to do so. I do not trust the military. While many praised their actions (or inaction) during the protests, I think they failed to act in the best interest of the protestors. Sure, there were some emotional moments shared by individual Egyptian troops and protesters, but they were obviously acting on orders to attempt to dissuade the protesters also. I think the military realizes they have a beast on their hands that they are unable to control in the form of the revolutionary movement though. I believe they will fulfill their promise to hand over power to a civilian government, fair elections will be held, and the constitution will be reformed or entirely re-written. I only hope that I'm not proven wrong.